It's not the -ography that upsets him. Me: Oh, that's great. I'm so glad you enjoyed it. Want to see what I'M reading? Me (waving the book around, a bit crazed): It's a retelling of Rumplestiltzken, and it's super fantastic. Look at the cover! It's so pretty! Look! Look! Patron (backing away slowly): Well, it looks... wonderful. You enjoy it, dear. I'm going to look for another James Patterson book. I should probably polish my reader's advisory skills a bit. A Curse Dark as Gold is a retelling of Rumplestiltzken, though I found it much more attractive than I ever found the fairy tale. It's about Charlotte Miller, the oldest daughter of the recently deceased owner of Stirwaters Woolen Mill. If she and her sister are unable to keep the mill running, to turn a profit, than the mill—which has been in the family for five generations—will die. If the mill dies, so will the town. Enter their lilac-scented, powdered and bewigged long-lost uncle. At first, the girls are hopeful that he will help—but he quickly makes it clear that he believes the only thing to do is sell the mill and marry the girls off. Enter the young banker, who informs the girls that the bank he represents wants the mortgage—NOW. Enter Jack Spinner, who can spin straw into gold, who can save the mill. But at what price? Charlotte is a stubborn and likable heroine (though I predict that some people will be frustrated with her refusal to ask others for help). Curse has loads of atmosphere and the story feels familiar but, at the same time, new and different and surprising. Elizabeth C. Bunce's spin on protective circles was simple and just (I can't believe I'm about to say this, but here goes) lovely, and her Author's Note provides not only suggestions for further exploration but also her issues with the original story. It's FANTASTIC. Highly, highly recommended to fans of Shannon Hale, especially to those who loved Book of a Thousand Days for its historical-fiction-with-a-dash-of-fantasy feel. I was reminded a bit of The Perilous Gard for the same reason. Also, obviously, give it to any and every fan of fairytale retellings. *A lot of them call me dear. It's odd. The only possible explanation is that I must have an excellent game face at work. One part, "Oh, good one." One part, "What?? No WAY." One part, "I've been meaning to read that." One part, "That one sounds good." Three parts, "How could they have left off x?" In a nice move, they opened up the question to the public, and people have been adding their suggestions. There's not much in the way of recent books, either in the original list or in the comments section (though I haven't made it all the way through yet). • ...I was busy reading A Curse Dark as Gold. More on that in a moment. • I did manage to get a few bracelets posted at my Etsy shop, though. Now it belongs to you. Mu ha aa aa! • House of the Scorpion LEGO book trailer! Fuse is right -- if you haven't read the book*, it won't make any sense. • Sara Zarr has a playlist for Sweethearts at Largehearted Boy. • Fine Lines on Jacob Have I Loved. **As in, story that makes you say, "Grrrr." Serious plans were afoot, then, to bring Cass and Tom together at Godmersham. Did Jenny's exclusion from these discussions signal her exclusion from the party? If so, it would not be for the first time. Three years' difference in age did matter sometimes, however often people commented on how inseparable the sisters were. 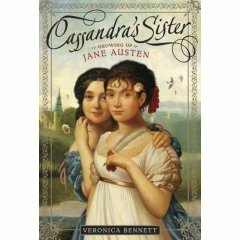 Cass was regarded as a woman--twenty-one, calm and practical, blissfully engaged to an equally level-headed man--while Jenny was still seen as a fledgling woman, half-formed, without her sister's polished manners, and her head always full of questions no one seemed able to answer. I really enjoyed Veronica Bennett's novel about Mary Shelley, so I was excited about picking this one up -- and it didn't disappoint. Like Angelmonster, it is a fictionalized retelling. Yes, the book contains facts about her life, but much of the story is imagined. Fans of Austen's books will recognize character traits and social situations, but it isn't necessary to have read her work to enjoy the book. Jenny's hopes and fears and frustrations (and for some, her ambition) will be familiar to readers regardless of their knowledge of Jane Austen's novels. It's a quiet book. I found it completely engrossing and also comforting, though it did have me feeling quite melancholy by the end of the epilogue. I'd give it (of course) to teen fans of Austen, but also to readers of historical fiction and aspiring writers.